Welcome to our latest eGullet Cook-off, number 48, Grilled Pizza. You can find the complete Cook-Off Index here. Our last cook-off took us into the world of Asian Tofu dishes. Tofu, one of the world’s oldest and most versatile vegetable proteins-an inexpensive ingredient that yields exotic and flavorful dishes. When Summer weather beckons, we move the kitchen outdoors and onto the grill, the smoker, the barbecue or the hibachi. And while we typically associate outdoor grilling with meats, fish and vegetables, there is another favorite food that is delicious when grilled on the barbecue-pizza! Of course, pizza is the subject of great debate. In fact, two recent topics on pizza have garnered quite a lot of discussion in the eGullet forums-“The best pizza in New York,circa 1999” here and “Alan Richman’s Top 25 Pizzas,” here. When you think about it, grilling a pizza over an open fire on your barbecue grill makes perfect sense-traditional pizza ovens are fired with wood or white-hot coals. Grilling a pizza results in a crispy-crust with a smoky flavor and oozing cheese. And a grilled pizza doesn’t have to be savory-fruits and sweet pizzas are wonderful on the grill-caramelized fruit sugars mingling with sweet cheese and honey are just one of the endless possibilities. Please join us as we explore the art of grilling pizza and the creation of some unique dishes for your summer barbecue parties. I’m a rookie when it comes to grilling pizza. I've seen Bobby Flay grill pizza on some Food Network show, but I never thought to try it myself. 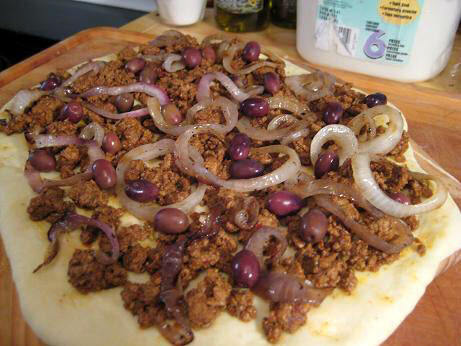 Most of the pizza I make at home follows a standard format using a pre-made, store-bought crust topped with pepperoni, Italian sausage, mushrooms, canned, sliced, black olives and grated cheese out of a bag. The only adventurous technique in my repertoire is to bake the pie on a pizza stone and then turn-up the broiler for a few minutes to char the top and melt the cheese. It comes out sort of looking like it came from a pizzeria and it tastes pretty good. Would a grilled pizza add a flavor and texture element that I was missing with my standard oven-baked pizza? The heart and soul of any pizza begins with the crust. Because pizza crust is such a very personal matter, far be it from me to dictate the definitive crust recipe for a grilled pizza. I’ll begin by relating a personal story about what I like in a pizza crust and then follow with my adventures in crafting the dough that would become the crust for my grilled pizza. When I set-out on this quest to grill pizza I was transported back to the taste memories of the wonderful crust of “Pietro’s Gold Coast Pizza,” from Salem, Oregon. I first tasted Pietro’s pizza in the early 1960’s-and I haven’t forgotten the taste of that crust-not doughy or thick, it was a “thin” style crust brushed with oil and a thin film of tomato sauce. Crispy on the bottom and blistered with soft bubbles of dough on top, the Pietro’s crust is to this day the standard by which I judge all other pizza crusts. No other crust comes close. Pietro’s operates three “Gold Coast” pizza parlors in Oregon today and they still make the dough for their crust daily. This was the crust I had to have for making a grilled pizza. Last week I contacted the President of Pietro’s via an e-mail to the main parlor in Salem. I began the email by relating a story about eating a delicious “Barmaid’s Special” (Candadian Bacon, Ground Beef, Pepperoni, half with Anchovies) in 1965. I thought the personal approach would be a soft-opener for the real reason behind my e-mail-I wanted the recipe for Pietro’s crust. I got a very nice response, basically a thank you for my family’s lengthy history as a customer of Pietro’s. I didn’t get the recipe for the crust. I had to fall-back on the standard recipe I use on the rare occasions I make dough and craft pizza crust by hand. But would my standard recipe create a crust that would withstand the intense heat of an open flame in the barbecue grill? I didn’t do much research on the scientific formulas for making a dough for grilled pizza. (I am sure there are some experts among us who are knowledgeable about the intricacies of yeast doughs that are best-suited to cooking on an outdoor grill). 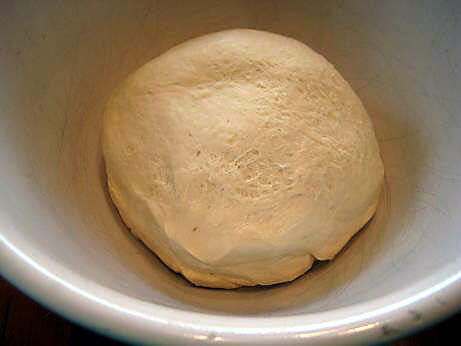 I figured that I would start with a basic pizza dough and use the fundamental test of taste. Hopefully that would lead me to the answer of whether or not my pizza crust recipe would work on the grill. 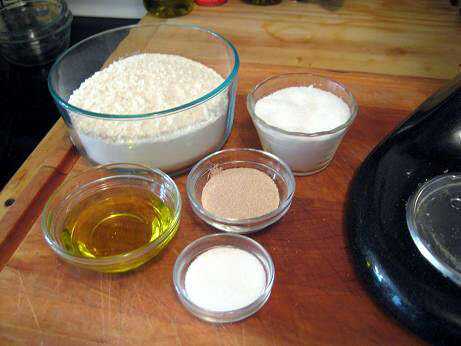 While the dough was rising I started making the ingredients that would top the grilled pizza. If I was venturing into the world of grilling pizza, I didn’t want to do a standard pepperoni and green pepper topping. I was thinking more along the lines of something exotic, aromatic, spicy, and full of flavor-maybe the type of grilled meat one associates with open-air markets in North Africa or the Middle East? I found inspiration in the idea of spicy meat with “grilled” bread. 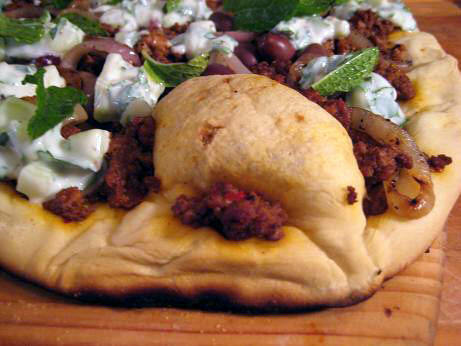 I settled on “Grilled Pizza with Lamb Merguez Sausage, Grilled Onions, Olives and Cucumber Raita.” Sounded good, now I just had to pull-off my lofty concept. Great timing for this cook-off. 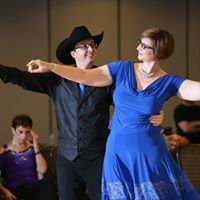 I need help with the technique itself. Last week, when my oven stopped working, I attempted a batch of grilled pizzas, but I had a problem with the crusts getting too well-done, while the toppings weren't done enough. I tried cooking over the heat and beside the heat -- but I had problems. Can somebody give me the 411 on how to get the toppings hot and melted and the crust crusty but not burned? Did you close the lid? I'd also go sparingly on toppings. I've done this a lot, it's killing me that I don't have a working grill right now! Yep - closed the lid. Could easily have been 'over-topped'. I used the gas grill, brushed the crust with olive oil and cooked one side -- pulled it off and topped that side, then back on the grill, raw side down on the hot side -- just enough to seal it -- then moved it over, away from the heat and closed the lid. 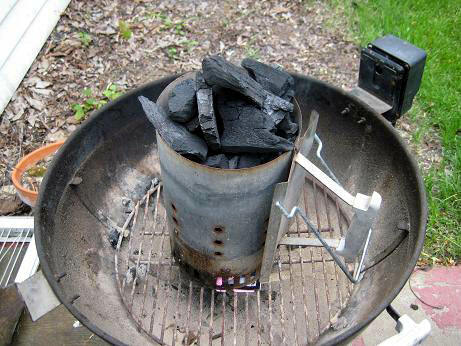 Depending on how hot your coals are, you might need to monitor doneness very closely. I use a spatula and tongs to peek under the crust and rotate on and off the heat to achieve the proper level of charred spots. Then I flip it onto a cutting board to apply toppings, then slide the whole works back on. Rotate again while monitoring the underside and to melt cheese. Your toppings will not be cooked at all during the grilling process, so pre-cook if necessary and have everything warm or at room temperature. I have a fairly simple recipe for my grilled pizza. I'm horrible at making doughs, so I went with a pre-made (but not pre-cooked) dough from Fresh and Easy. I work it pretty well while it is still cold (the one time i let it get to room temp before throwing it, it ended up paper thin in the middle and too thick around the edges). I let it warm just a little from the heat of my hands, and throw it until it makes a crust about the size of a standard 12" dinner plate. Grill this over direct heat for one to two minutes, checking often to make sure the bottom does not burn, then take off direct heat, clost the lid and let bake until the cheese is melted and the proscuitto gets a little bit crispy, about 10mins on a medium temp grill. Once the pizza is ready, toss a handfull of chopped herbs on top, my favourite combination is equal parts parsley, oregano and chiffonaded basil freshly picked from my garden. Let it go for another minute or so to heat the herbs through and let them get fragrant. Take off the heat, let cool just enough that the cheese doesn't burn your mouth, and enjoy. As noted above by some of our grilled pizza experts, one of the keys to a grilled pizza is getting the temperature of your fire just right and balancing that with the proper technique for moving the pizza around the grill so that the crust doesn’t burn. (I can attest it is a matter of experience and one I haven’t yet mastered, but more on that, with visuals, later). Another key point mentioned above is planning, pre-cooking and assembling your pizza toppings before you get to the point of grilling the pizza. I realized before grilling that I would need to pre-cook the meat for my pizza because 3-4 minutes on the grill would only be enough time to cook the crust-not nearly long enough to adequately cook lamb sausage. Merguez is a spicy sausage typically made from lamb or beef and is most often associated with North African cuisine. However, merguez is popular throughout the world and has recently found a welcome spot on my roster of homemade sausages. I recently made lamb merguez and used it as the meat stuffing for tacos-a marriage of North African and Mexican cuisine if you will. 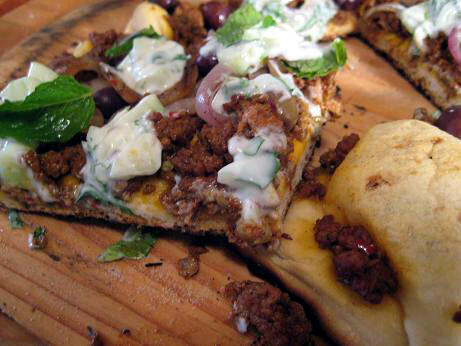 I thought the idea of making a spicy meat sausage would marry well with a smoky, grilled pizza--a crisp-crust topped with a spicy mix of ground lamb garnished with dollops of refreshing, crisp, cucumber raita. 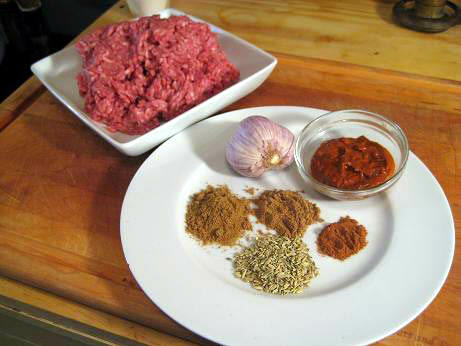 I prefer to make merguez myself because I can control the level of heat and the mix of aromatic spices in the sausage. One of the characteristics of the merguez I make is the addition of harissa, a paste made from dried chile peppers, garlic, cumin, coriander and caraway seeds. 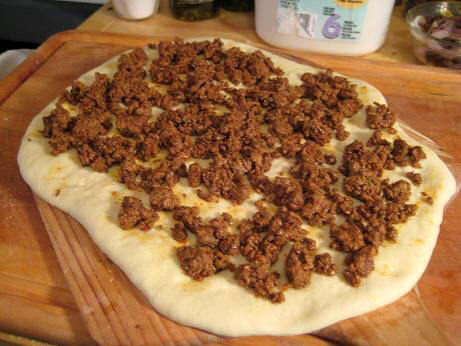 The next steps will show the additional garnishes, shaping and forming the pizza dough, then “into the fire” we’ll go. I'm horrible at making doughs, so I went with a pre-made (but not pre-cooked) dough from Fresh and Easy. I work it pretty well while it is still cold (the one time i let it get to room temp before throwing it, it ended up paper thin in the middle and too thick around the edges). I let it warm just a little from the heat of my hands, and throw it until it makes a crust about the size of a standard 12" dinner plate. 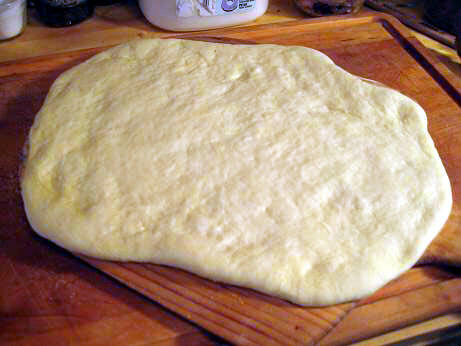 I use a no-knead method for pizza dough with great success. See slkinsey's description. To my taste, salt is needed - 2 tsp per kilo of flour. I roll mine when I'm going to grill it and haven't noticed any ill effects. There are still plenty of air pockets that inflate when the first side is cooking. 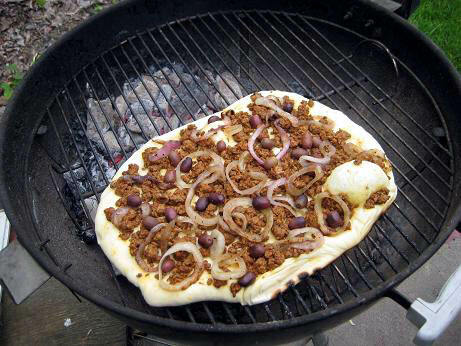 There's a Bon Appetit cover recipe for barbecue pizza that I tried in the summer of 1996 and I've be doing it ever since. Make the dough in a mixer, grill one side, flip and add the fixin's. Should a pizza be round? Never trust a round pizza. Excellent thread. I made a white pizza on the grill last night. I use Peter Reinhart's pizza book for my dough formulas. My favorites are the Neo Neoplitan and the Grilled pizza doughs. I typically hand stretch my do to approx 1/8" thick, dock it, and then grill it for a couple minutes until the bottom side is starting to brown. 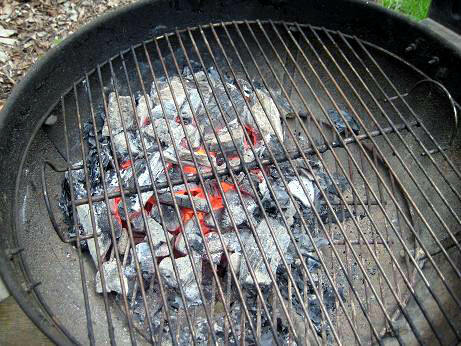 I then pull it off and top it and put it on the grill again to finish it up. 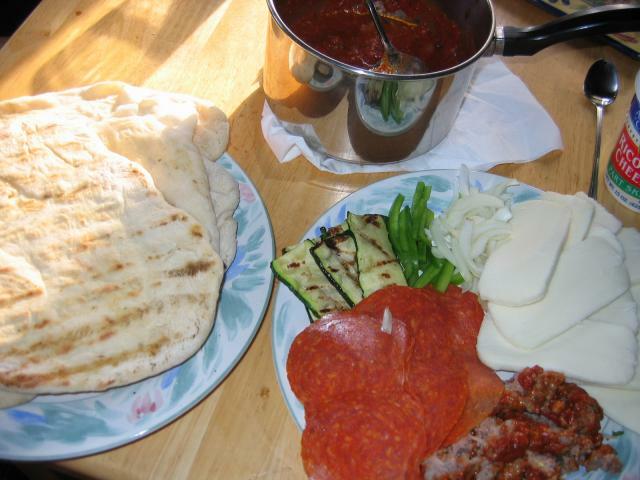 My favorite toppings are grilled veg and a very light amount of fresh mozarella. David, would you mind sharing your harissa recipe with me? Peter. It does not need to be round. Rectangular or amophous works just as well. However, the more consistent the shape, the more evenly it will cook. I heartily echo the comments that a grilled pizza needs to have the toppings applied with a light hand. I've also had the best luck stretching my crusts (sized for one person; a more oblong shape is more efficient than a round on my rectangular grill) and getting the first side grilled (lid down, please). Especially when I do this for a group of people, I typically one-side-cook all the crusts. 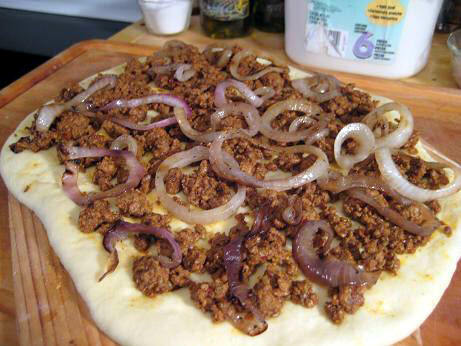 Everyone then tops their own crust, applying the toppings to the cooked side. I try to have the toppings at room temperature before they go on. Then the topped pizzas go back on the grill, to finish cooking the crust and get the cheese melted. My pleasure. As you probably know, harissa is a versatile spice paste that is a wonderful addition to all sorts of dishes. 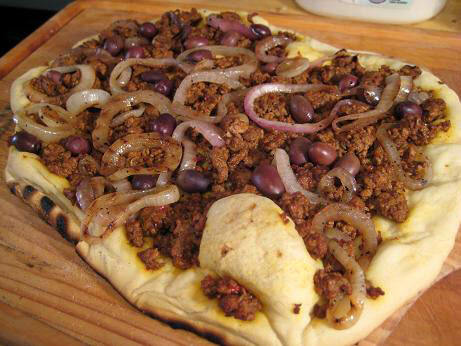 And it made for one good spicy lamb merguez to add to my grilled pizza. 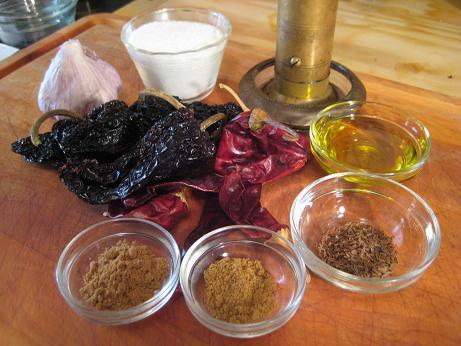 You can use whatever dried chiles suit your tastes and propensity for heat. I tend to use mild chiles. 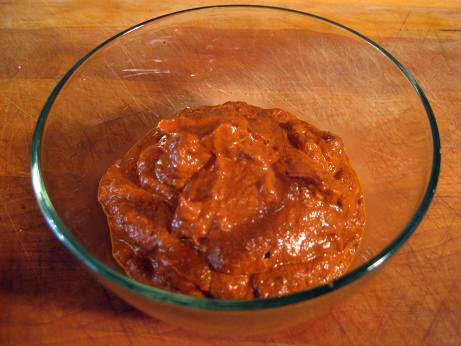 For this harissa I used about 6 guajillo chiles and about 5 ancho chiles. 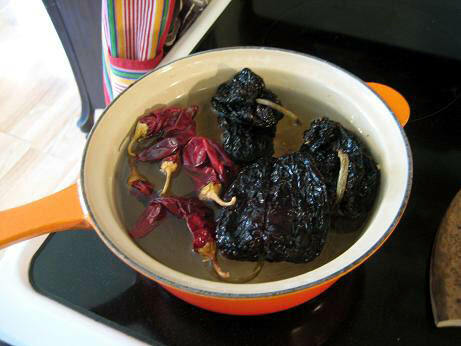 Re-constitute the dried chiles in hot water for about 40 minutes. Using rubber gloves, pull off the stem and remove the seeds from the chiles. 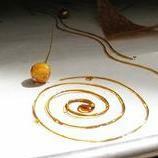 (Reserve the poaching liquid and use in soups, stews and chili). 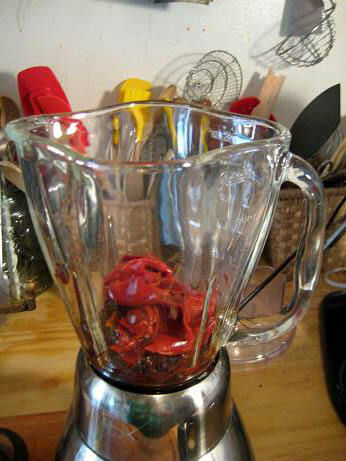 Place the chiles in a blender or food processor. Heat the olive oil in a small saucepan over medium heat. Add the garlic cloves and the caraway seeds and toast just until the seeds start to brown and pop, about a minute. 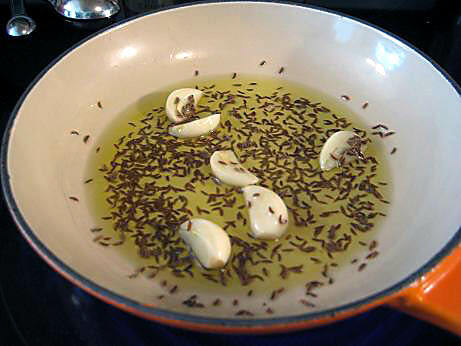 Pour the olive oil, garlic and caraway seeds in the blender and add the cumin, coriander, salt and black pepper. 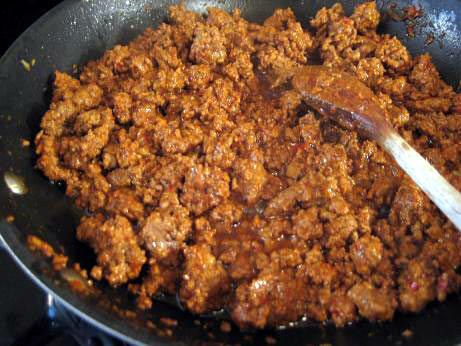 Puree the harissa into a paste, adding some of the chile poaching liquid if the sauce is too thick. Because I was going astray from typical pizza toppings with the lamb merguez, I felt that a traditional pizza topping of cheese wouldn’t be the best accompaniment to the spicy sausage. 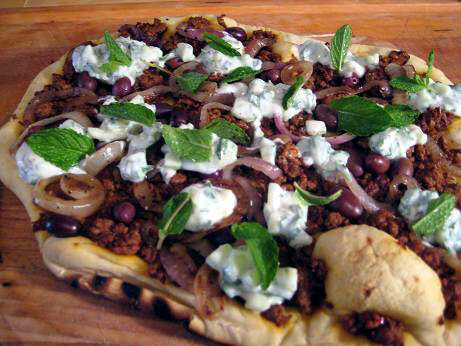 I decided that the main garnish on the pizza should be a cool, refreshing, crisp, cucumber raita to tame the heat and spice of the sausage. I don’t really use a recipe with measurements when I make raita. Depending on what I’m serving the raita with, I’ll vary the amount of yogurt and cucumber to give the raita a heavier or looser texture. For this version, I used less yogurt and more cucumber to stand-up to the merguez. Next steps, stoking the fire and rolling out the dough. As you can see from the photo, at least in my kitchen, the answer is pretty clear-a pizza doesn’t have to be round. 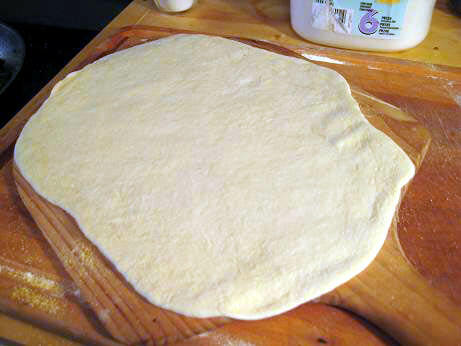 In fact, I don’t think I’m capable of forming a perfectly round circle of pizza dough. Yet I suppose one can find beauty in a “rustic” pizza that is hand-crafted--the unique personality of each pizza coming from the fact that it isn’t “perfectly” round. As I mentioned earlier, I didn’t do a lot of research on grilling pizza before I undertook this adventure. I wanted to learn as I went along, and I knew that I’d gain a lot of knowledge through our discussions that I could apply to my next attempt at grilling pizza. Trust me when I say that I quickly learned that the two most critical areas of concern when grilling pizza are the crust and the fire. I had spent hours making the harissa, the lamb merguez sausage, the raita and proofing the dough, but it would be the timing of the last few minutes of the process, the grilling, that would prove to be the defininf moments of my success, or lack thereof, at grilling pizza. Now things were literally heating up-the fire was lit and the crust was ready for the toppings. I’d have to run the pizza outside to the grill at precisely the time the coals were hot, slide it onto the grill, hope that the sausage would heat through before the crust burned, then run the hot pizza back inside and garnish it with the chilled raita and sprigs of mint just before slicing and serving. (The beverage part of dinner was easy-cold beer was poured and the chilled Sauvignon Blanc had been opened). A beauty of a white-hot fire of hardwood charcoal. Did I get the fire too hot for my grilled pizza? For a very, very short moment I wanted to cheat. I wanted to put my oven pizza stone on top of the grill. I knew if I did used the pizza stone the crust probably wouldn't burn-at least it wouldn't burn as quickly as if the pizza was put directly on the grill. But that would be cheating wouldn't it? Williams-Sonoma sells a contraption that is basically a pizza stone that will fit on your outdoor grill. But simply cooking a pizza on a hot stone, whether it's in your oven or over some hot coals isn't technically a "grilled" pizza. 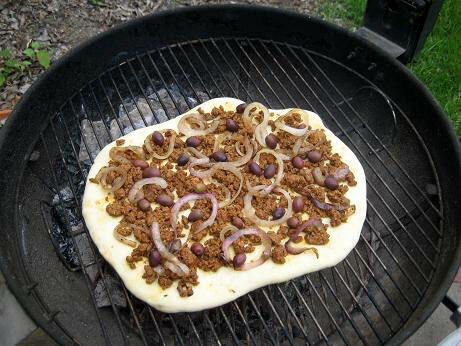 A true "grilled" pizza is just that-a pizza put directly on your grill. I didn't cheat. I continued on to the moment of truth in grilling pizza. David, you appear to have the opposite grilled pizza philosophy as me: I absolutely minimize the toppings, probably to the point of absurdity. A very thin layer of sauce, a little grated mozzarella di buffala, maybe a few olives or onions, but not many. Some basil chiffonade after it cooks. I've never had good luck maneuvering a pizza on the grill when it had a ton of toppings on it. How do you manage it? 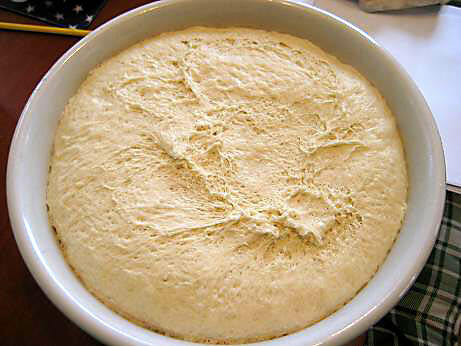 One trick is to prebake your dough on one side. 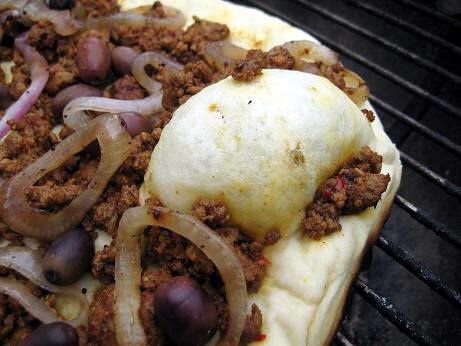 Put the topings on the "baked side" and finish cooking your pizza by placing it "unbaked" side down on the grill. Actually, I didn't have a sound philosophy for grilled pizza prior to this attempt. And based on our discussons so far, I'm learning that the philosophy of less is best applies to grilling pizza. A heavy layer of toppings would probably never get hot enough, nor would the cheese melt properly, before the crust would be incinerated on the grill. I didn't have any problems moving the pizza around the grill. I just used the wooden peel to maneuver it so the crust would cook evenly. I wear heavy work gloves when I'm grilling to help keep the heat at bay. David... that just looks stunning! Does anything else go on the pizza after it is cooked? Thanks! 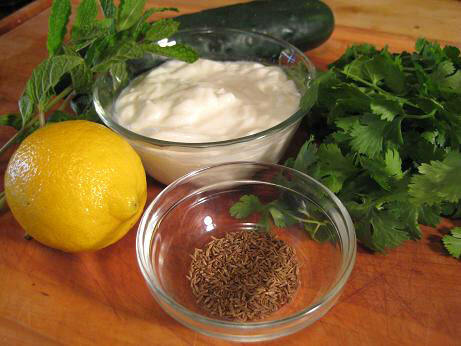 And yes, we still have the cucumber raita and some fresh mint to garnish the grilled pizza. Stay tuned. The toppings were delicious, but the the foundation of my grilled pizza, the crust, was what brought down the final grade. It was too thick, a bit dry and it was charred on the bottom. Surprisingly, the burned layer on the bottom of the crust didn’t really disturb the overall flavor of the pizza. Next time I’ll roll out the dough so it’s thinner. The recipe I use for regular pizza dough rises a lot, resulting in a final crust that is thicker than I would prefer for my next grilled pizza. And I'll only add a smattering of toppings so they'll cook at the same pace as the crust. Secondly, I’ll thoroughly brush the crust with olive oil so that it doesn’t dry out while it’s on the grill. (This may be a bit tricky because I don’t want the olive oil to ignite while the pizza is grilling). I’ll tame the fire a bit by using about half as many hardwood briquets. I think I got the fire too blazing hot this time, good for searing a steak but not so good for grilling a pizza. And I’ll try the above suggestions for quickly grilling one side of the crust, adding the toppings, then finishing the pizza on the grill. Later this week I’ll try another pizza grilling adventure-a dessert pizza using a sweet crust, apricots, honey, walnuts and mascarpone cheese. Show us your best grilled pizza! Yep - that is what we do. We also use indirect heat for part of the cooking time. Works very well.